Did you know that rubber mulch is the safest playground surface with a fall height rating of 16+ feet? 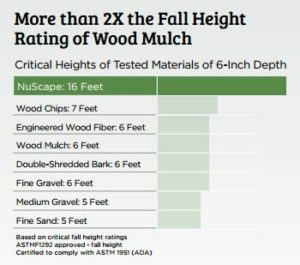 For those that use wood mulch the fall height rating is a mere 7 feet which could lead to more injuries for little ones on the playground. Loose-fill rubber mulch may cost more at the start than wood mulch but over time the savings continues to add up while the injuries continue to fall. If you would like more information on how to have the safest play area in your area please click here and we will follow up with you to answer any questions that you may have.